I have lived and worked in Cambridgeshire just about all of my life I did work for a while on the outskirts of Peterborough, a matter of just a few months but that is all. I like the fens because of their openess and the skies, the skies are an everchanging picture, each second unique and different unemcumbered by the clutter of buildings they allow the really big picture of the sky to be seen.These are just a few of the photos I have, not every day brings skies as spectacular as these but we get plenty of them and there are plenty of days of sunshine. Remains of an old wind pump at Ramsey St Marys. I have wanted to photograph this old wind pump at sunset for some time but never had the opportunity, I intend to return for some more pictures in the future. It has a certain beauty for me mingled with a sadness that it is no longer needed and just left to rot. So much of that which is built on the fens has about it a feeling impermanence, of borrowing its’ existence from the waters that have been drained away and one day may return. Many buildings built on drained land have foundations that move with the shifting fen beneath them very few walls remain plumb even only after a few years. The most immediate effected by the shifting ground under our feet are the roads. 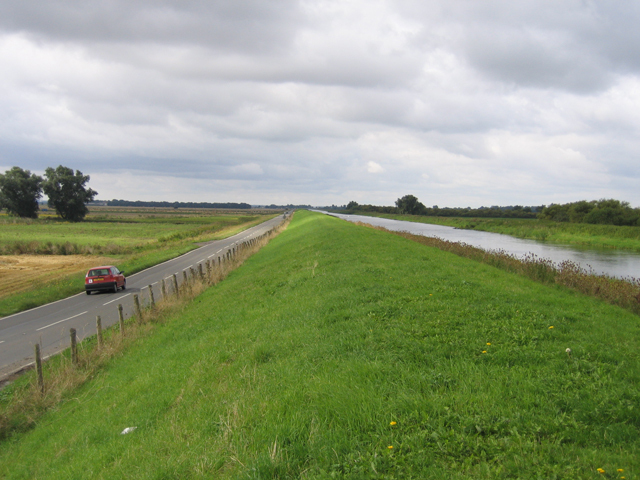 Many fen roads move on a seemingly daily basis until after a short time dips and ridges form that can throw unwary vehicles in any direction.